Massachusetts Roads - Leverett area Leverett, MA and Leverett Rd. 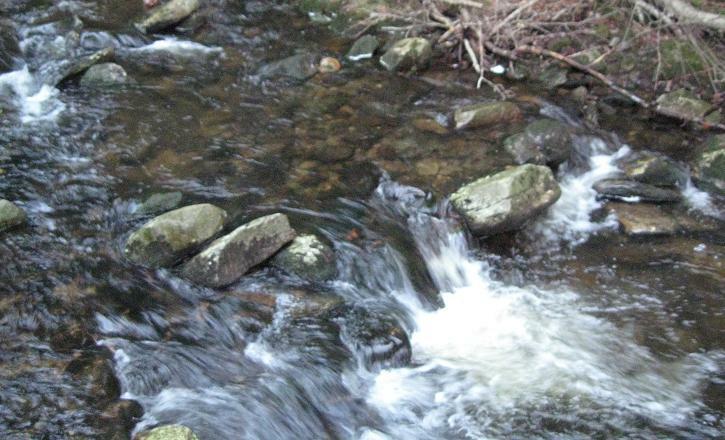 All photos were taken, slowly progressing from east to west, on November 29, 2008. 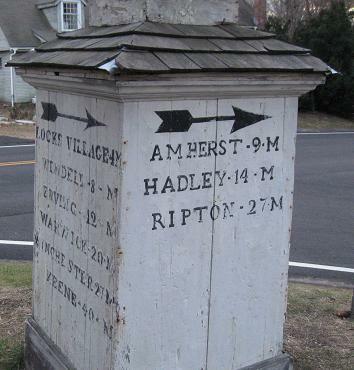 A peculiar hand-painted monument marks the corner of Wendell Rd. 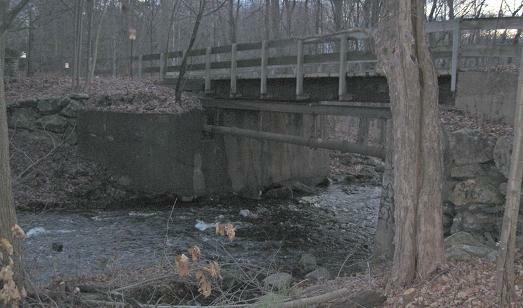 at Cooleyville Rd., Shutesbury, MA. It goes on this page because Leverett Rd. 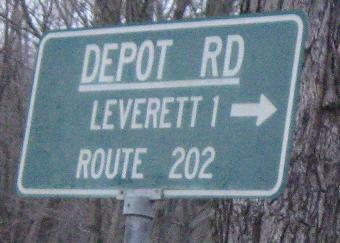 begins at this intersection, running west to Leverett. I start on the west face and rotate around north, east, and south, except there's no NB road to see the southern face of the monument. 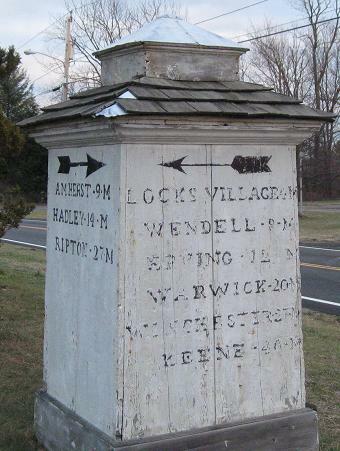 If the destination of Keene (NH) looks surprising, you'll see that Wendell Rd. actually winds its way north into MA 78, and I'm sure was once the main road in that direction. But there's one destination that doesn't look surprising, but should. 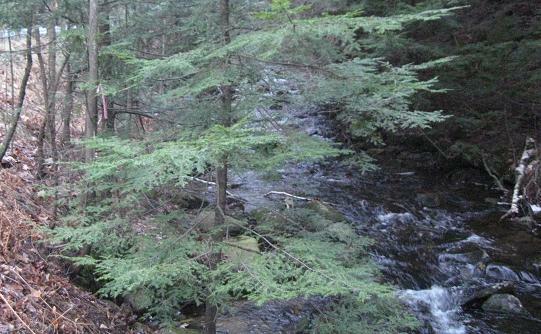 Welcome to Ripton, MA, 27 miles from here and everywhere else because there IS no Ripton, MA. 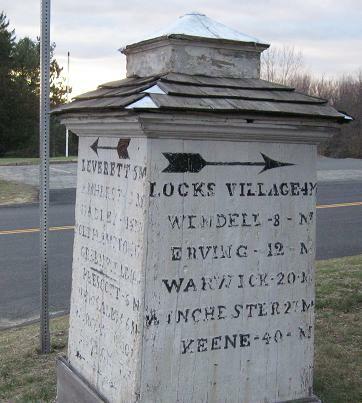 The town was invented by a UMass professor as a protest against Boston's ignorance of Western Massachusetts issues (and funding, especially). The hoax was so convincing, Ripton was written into state legislation and received funding - luckily, the perpetrator being an honest professor, taxpayers' money was not wasted on helping Ripton citizens continue to not exist. 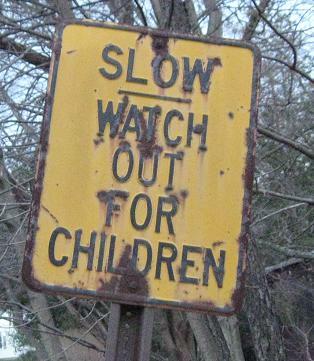 This sign was not erected by the state in their ignorance, but by locals in their knowledge as a humorous poke at the east for anyone in on the joke. 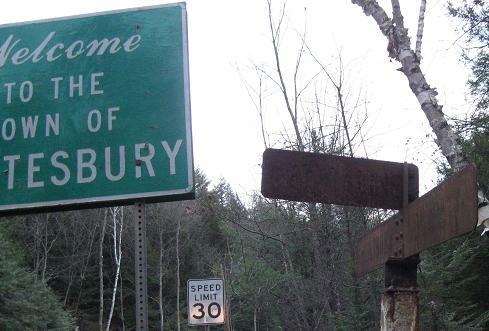 And because Ripton was only created in the 1980's, sorry, folks, but this sign (at least as currently painted) just isn't that old. 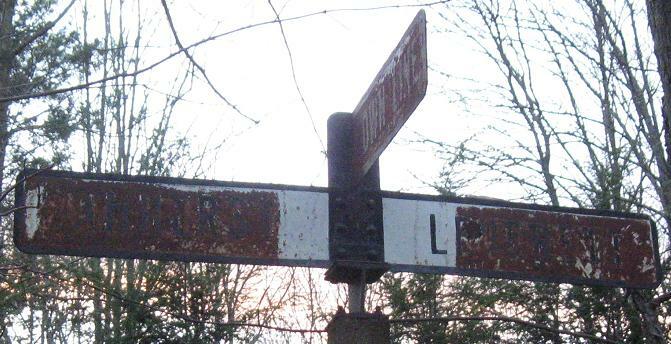 The first rusted town line sign, on the east side of Leverett. You can almost make out "TOWN LINE" in the second photo. 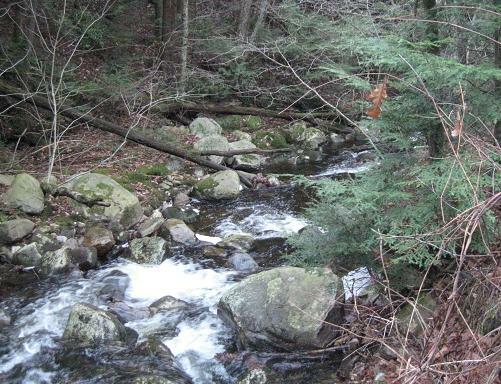 Panning from west (Leverett) to east (Shutesbury) on the south side of the road where Roaring Brook runs. 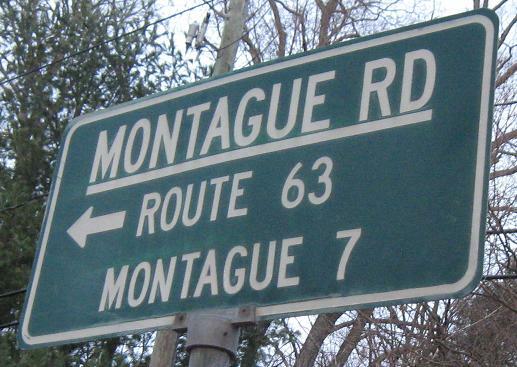 Similar non-reflective street signs with destinations on them in a combo deal, and an imitation sign that fails. 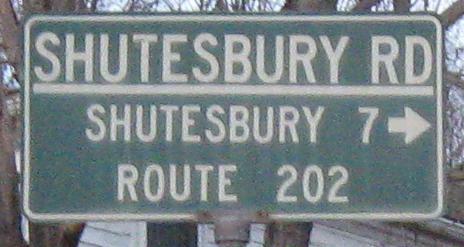 The first is Shutesbury Rd. 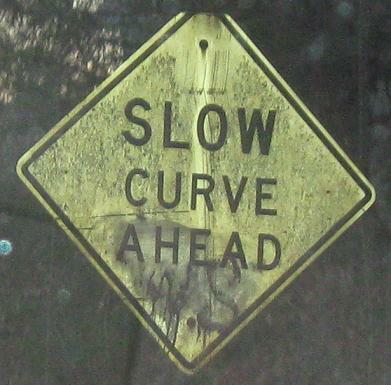 WB turning right at Cushman Rd. in East Leverett. The second is Depot Rd. EB in Leverett. The third is Amherst Rd. NB, and the fourth is at the same intersection on Depot Rd. WB. 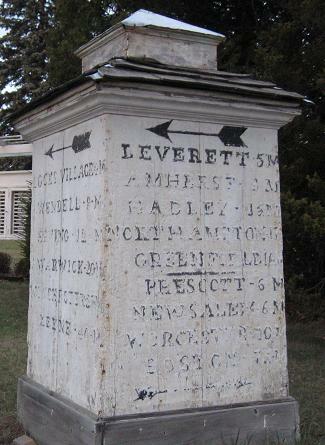 Reaching the southwestern border of Leverett on Amherst Rd. 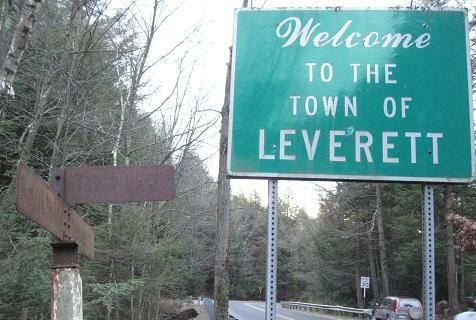 When it crosses into Amherst, it magically becomes - Leverett Rd.! Mill St. is cheating because it does not directly intersect Leverett Rd. in Amherst. 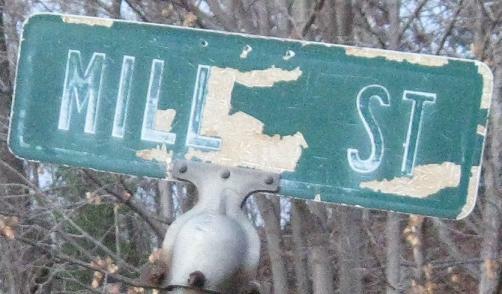 It's a block in on State St., but I'll bear the accusations of cheating to bring you more good material on this page. 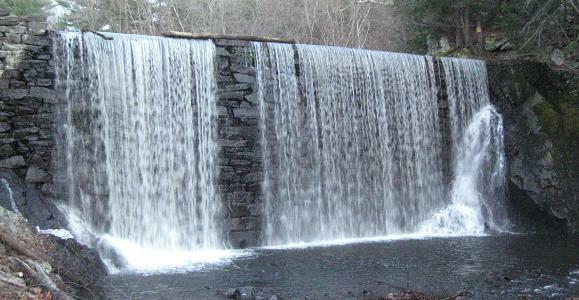 Factory Hollow Pond falls off into the Mill River, which Mill St. crosses (from north to south) as it flows past new houses and on its way to the University of Massachusetts.